It’s been a long wait, but the fuel cell car is here. At least in South Korea. But it’s far from big yet. Many people are convinced that fuel cells are a great technology, but car manufacturers have been slow to answer their hope. Hyundai’s taking the lead however, the Korean company will build 3 to 4 fuel cell cars each working day. Manufacturing of 1,000 cars have already been approved. That’s much more than what Honda, General Motors or Daimler have already built, and I bet it will be hard for all the other guys to play catch-up now. 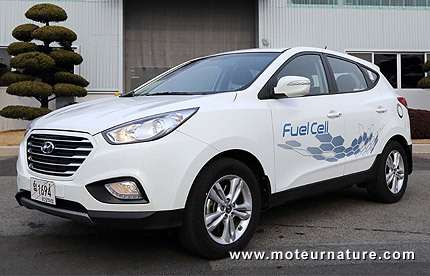 The Hyundai iX35 Fuel Cell will be at the Geneva motor show next week, and as I’ve had the rare opportunity to test drive a prototype last year, I can testify how great it is. High pressure hydrogen tanks store 5.6 kg of the stuff, and that allows for more than 350 miles of driving. Performances are only adequate but the smoothness of an electric drive is a strong bonus. 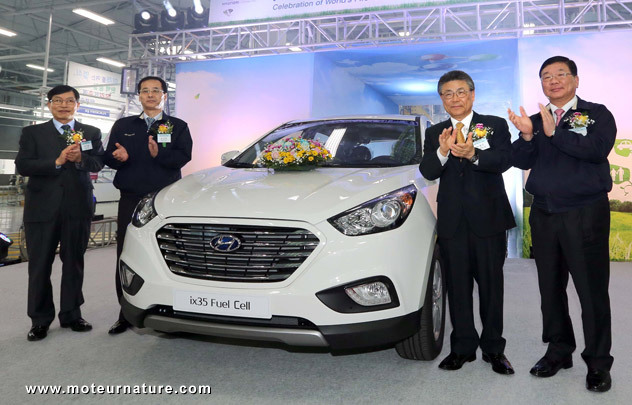 So let’s hope this iX35 Fuel Cell gets produced in even larger numbers sometimes, and that they don’t stay all in South Korea.